Since the first day Chris entered our home, he has established himself as the alpha kitty in all areas except food, especially canned food. He likes the canned food and will eat it but doesn’t place a high value on it like our other cats (past and present) do. Puck, however, was originally named “Chow Man” because of his love for food. Indeed, we named him Puck because, in part, he was into food as much as Wolfgang Puck. I feed the cats wet food twice a day, in the morning, when I get up, and when I return from work, or around 5:00 on the weekends. The same thing happens every time. Puck and Frankie jump on the counter while I am opening the cans. Frankie then jumps back down to the floor where Chris is waiting. He knows that is where he is fed so he wants to be there waiting. Puck doesn’t think that way. He is on the counter eating out of the first bowl as soon as I scoop food in it. That is when Frankie starts talking to me, telling me to hurry up. I quickly scoop food out for the other two cats and set it down in front of them. Chris will then eat for about thirty seconds and walk away. I think he anticipates Puck coming to take his food so he just leaves it before that can happen. I then have to pick up his food and bring it to him because Chris is somewhat of a dry food addict and I want him to eat as much wet food as possible. Sometimes I move his food two or three times but every time, before he finishes, Puck shows up to take over. Let me help you with that, Chris. I don’t know why big, bad, alpha-cat Chris allows his food to be taken from him so easily but he does. I also don’t know why Puck has to leave his bowl, which still has plenty of food in it, to take the same food from another bowl. 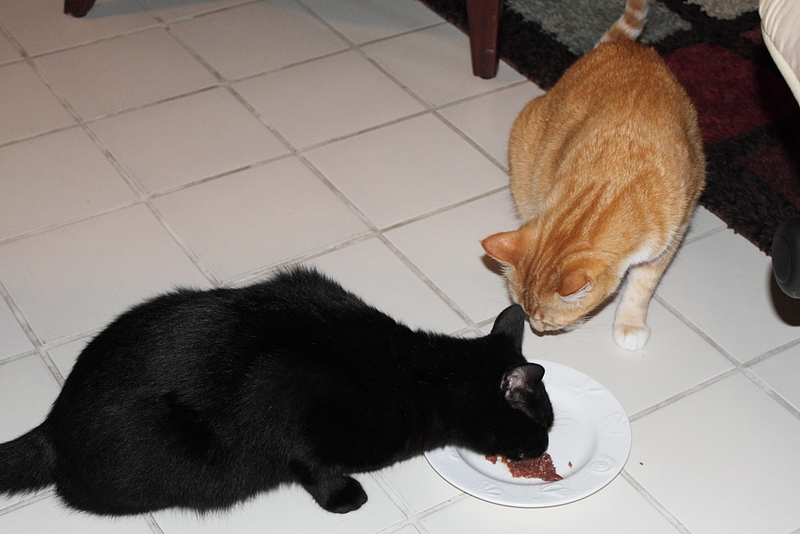 I usually then grab Puck’s bowl and put it in front of Chris but it isn’t long before Puck covets that bowl of food. This kind of behavior reminds me so much of another species. Hmm… I can’t quite put my finger on which species that is. Anyone have any ideas? This entry was posted in Uncategorized and tagged Alpha, Cats, food, steal on June 10, 2014 by Charles Huss. Puck does not try to steal Frankie’s food. Perhaps he knows Chris is an easy mark and sticks with what works. We have musical food bowls here too! It keeps my human on her toes. This Throwback Thursday post from 2014 isn’t much of a throwback because the same thing happens today except now we have Floki who is even worse than Puck. Puck sounds like my Sammy who we call Sammy the shop vac.